should be increased, and pool exercises can be used sparingly to change the program. Abdominal exercises should be performed daily. The patient should try to complete them at the site of training intermittently with sport-specific drills to overload the muscles and force them to function under fatigue. Through basic physiologic principles, we know this is how we are going to make them stronger and more effective in a sports-specific manner. The patient should gradually work into this concept to prevent an additional injury from occurring. Around the third month postoperatively, the athlete should be progressively returning to practice and, soon after, to competition. The athlete must be completely prepared physically, technically, and psychologically before fully entering athletic competition. This remains the combined responsibility of the health care staff, coach, and athlete to ensure safety and efficiency in returning to sport. It is also important to maintain abdominal and core strengthening even with the return to competition to prevent any future injuries. FIGURE 5.19. 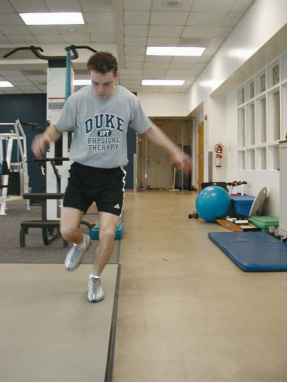 Plyometrics (single-leg lateral hops). This exercise is performed as a continuum to the two-feet lateral hops. The athlete performs small, quick, side-to-side hops over a line on the floor using only one foot. The duration of the exercise may also begin at 30 seconds and progress to 1 minute or more.